De Boer can provide accommodation solutions for emergency accommodation, temporary supermarkets, storage and distribution centres, showrooms, restaurants, clubhouses and a wide range of long and short term uses of temporary facilities. Adequate and readily available accommodation is a primary requirement and concern. Fires, floods, storms, hurricanes and other disasters leave people and businesses without a roof. War and unstable governments cause whole communities to flee. All over the world, people are migrating. But those who are sent out to maintain the peace, or provide disaster relief also need accommodation. Epidemics could necessitate setting up an emergency hospital or medical post. These are housing situations for which De Boer offers a solution in the form of high-endurance, secure temporary accommodation. Located all over the world, these shelters serve as reception centres for refugees and displaced persons, as medical posts, offices, schools or even as extra prison space. 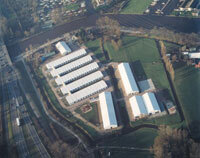 They are also used as army barracks: during the Gulf War De Boer tents served as temporary accommodation. One of the great advantages of temporary accommodation is the speed at which it is able to meet a sudden demand. In most cases this means that orders placed with De Boer today are operational within a few days. This is a must in emergency situations. Such speed can only be achieved because De Boer works with the most advanced systems, a specialised construction team and a highly efficient logistics system that can draw on worldwide stocks. De Boer moreover has at its disposal an extensive network of professional partners in various disciplines. However great the urgency, concessions are never made to the reliability and safety of the accommodation. The temporary shelters of De Boer are not only quickly erected, but in terms of size and shape they meet the specific needs of every customer. They range from simple accommodation to a fully laid out barracks complex with dormitories and dining halls, recreation facilities, kitchens, bathrooms, offices and stockrooms. By employing modular construction methods, every accommodation can be expanded or reduced at any time. This is a highly flexible system that can be effortlessly orientated to the space that is available and required and to existing circumstances. Because all shelters are constructed of multi-functional panels, virtually any conceivable interior configuration is also possible, so that sufficient privacy can be assured for the users. De Boer delivers turnkey solutions for retail accommodation on a semi-permanent basis with solutions that have proven to be both fast and flexible, whilst also able to meet the most demanding needs of retailers. In emergency situations, De Boer is able to deliver an up-and-running on-site solution at very short notice. 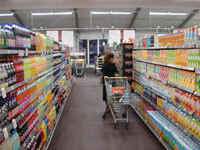 The modularity of our system, in combination with the available span (up to 50 metres) and height (up to 12 metres) is able to deliver a temporary supermarket that has the same dimensions of similar permanent buildings. This means that potential turnover loss is limited and existing clients are kept as returning clients. So even if your building has collapsed, your business doesn't have to. De Boer has also been brought into resolve seasonal retailing solutions such as food promotions, Christmas goods, summer barbecue and garden products. Additionally the De Boer retail concept proves very helpful in launching your premium retail brand in new regions, especially in developing housing areas. When there is not yet a requirement for permanent accommodation, a successful first step is the launch of your retail formula on a smaller scale. You will be able to start serving new customers in a professionally designed temporary building. The modern design of our structures provide a major asset for temporary restaurants, clubhouses and showrooms. Additional restaurant facilities can be achieved in stylish temporary structures without having to make major investments. When you have a refurbishment of an existing restaurant facility or when disasters such as fire or flooding occur De Boer is able to deliver a representative, turnkey accommodation within in a very short time span. For product launches or additional sales activities, showrooms of any size can be realised using a wide variety of structures, panels, doors, entrance canopies and windows. These showrooms can be used for a short period, but also for longer, even years. 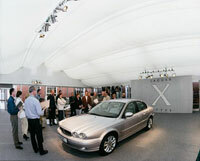 Additional showroom space can be achieved in stylish temporary structures without having to make major investments. When disasters such as fire or flooding occur De Boer is able to deliver a representative, turnkey accommodation within in a very short time span. Temporary warehouse structures offer a fast and economically attractive alternative for your storage needs. De Boer storage structures are available at short notice, enabling a fast response. Based on the modularity of our systems, we are able to offer any size to fit your site specification. Additionally, this flexibility also provides the possibility to offer customised solutions with overhead doors, personnel doors, sliding wall panels or specific temperature controlled conditions. 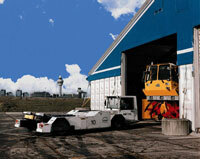 Every warehouse or storage system can be incorporated in our structures. In this way the business, financial and spatial needs can all be delivered to meet your specific requirements. The advantages of providing additional storage facilities in the direct vicinity of your existing business location are numerous: no additional transportation costs and convenient IT connections to your company network. The overhead costs with regard to security, maintenance and additional warehouse staff can be kept at a minimum level. 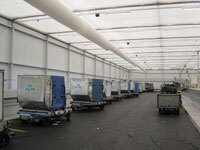 The broad range of possible applications for our temporary structures is also apparent in the area of distribution centres. De Boer offers the right accommodation solution, especially during uncertain market developments. Without the investment in new permanent accommodation or in long-term rental commitments for existing premises, De Boer offers flexible accommodation solutions that are extremely suitable and meet the sometimes enormous spatial demands that are inherent to distribution centres and luggage handling facilities. 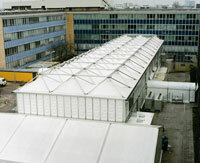 The Business market includes long and short term uses of temporary facilities. Examples include storage, retail, business continuity after emergencies, aviation, restaurants, hotels, prisons and distribution centres. No matter what type of business use you have in mind, De Boer has the right temporary accommodation solution. Any business that requires a temporary facility can rely on the first class services and structures of De Boer to provide the right accommodation or temporary building. With a choice of over 80 different types of accommodation modules and a full array of supplementary services such as heating, lighting, cooling and interior decoration, you may rest assured that your desired accommodation will become a reality. Our team is standing by to guide you through the possibilities. The A-shaped frame and roof line offers free spans from 8 to 50 meters and virtually unlimited length in combination with standard side and apex heights. The space frame technology allows large free spans and flat ceiling lines, with standard side heights of 3 to 6 meters. The steel frame allows for higher roof loads, thus increasing the use in more extreme weather situations. When you need that special attention grabbing location, one of these special designs is sure to deliver, also for more than just one day. From small peak tents functioning as an entrance to walkways connecting structures and buildings to structures.